I eat at A Great Little Place, a cafė in the heart of the charming town centre. And it does live up to the name. The vibe is attractive and pleasant, without being hipster or overly cutesy. But it’s the food where this place really excels. 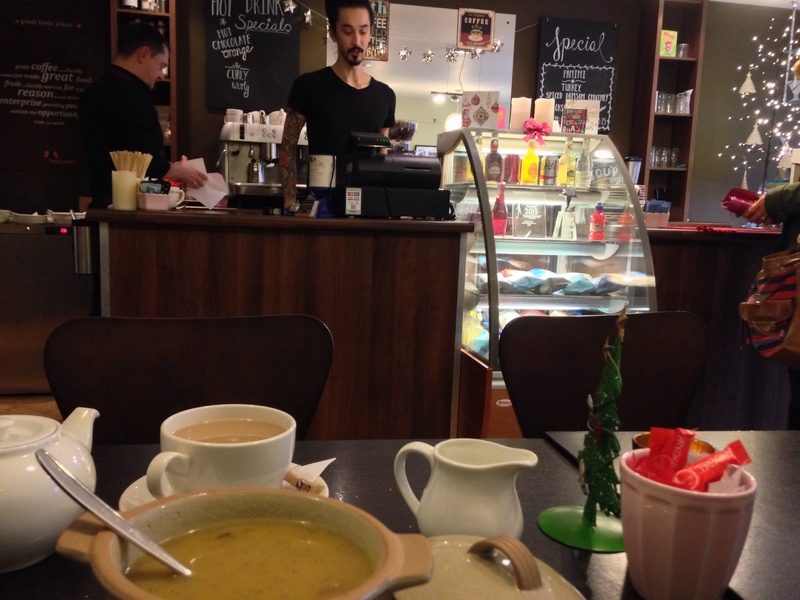 I go for an amazing chestnut and wild mushroom soup and a very nice bacon & brie panini. It’s hearty fare for a chilly Christmas afternoon – and combined with the handy location just a stone’s throw from Southport railway station, I’d have no hesitation in recommending it – though if a cosy cafė isn’t your thing, then there’s a huge range of good places to eat and drink in Southport. A delicious bite to eat at one of Southport’s best-loved cafés. I head into the sanctuary of The Grandstand Lounge, a bar within the ground, just along from the terraces of the ground’s Grandstand. There’s nothing particularly special about it – all sixth-form style tables, pints of Mild (I go for a Chestnut Dark Mild, which is quite nice) and hastily-added tinsel. But it’s a friendly place for fans to congregate, with football on the TV and fans discussing the upturn in form of Dino Maamria’s side. 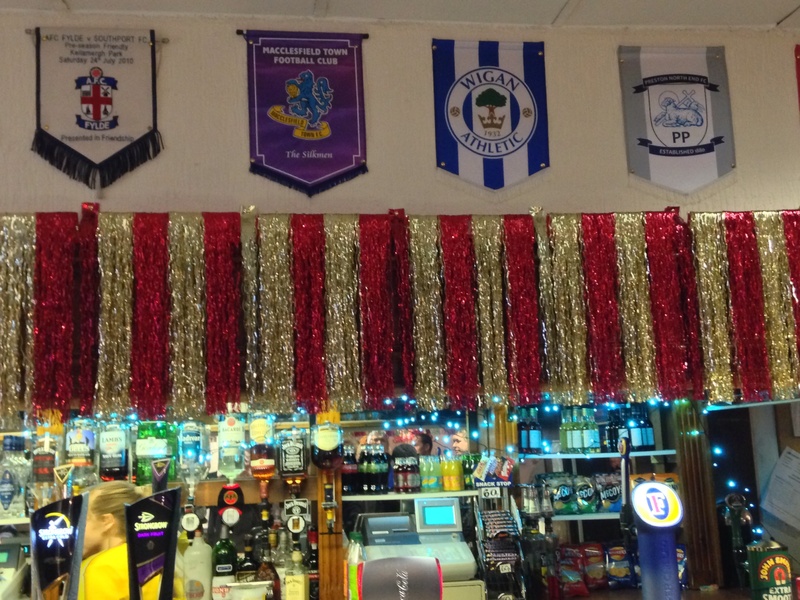 Esteemed company: pennants from several visiting Football League sides. I chat briefly to three chaps in Southport kits, to get a feel for their verdict on the Sandgrounders’ season thus far. As is usual at Non-League grounds, people are friendly and happy to chat. “Our season’s been as usual, as well as could be expected [for a part-time team]”, one gent tells me. “It’s now 7 managers in 2 ½ years, there’s no continuity”, another grumbles. But they all concur that there seems to be a new-manager bounce under ex-Southport player Dino Maaria. Two predict a draw, the other a narrow win. I thank them, and flick through this game’s issue of club program The Sandgrounder. It’s glossy, (fairly) well-written and includes one or two unique, slightly quirky features. The content is better than average for programmes at this level, but at £3, it feels a bit steep at a level of football where avoiding the overpriced trappings of the Football League is considered one of the main attractions. Today’s game starts at a frenetic pace, and the Santa-hatted away fans briefly think their side has snatched an early opener, when Steve Pinau fires a fierce shot with just 92 seconds on the clock. The ball, though, lands in the side netting. And there are chances at both ends. Jamie Allen hits a smart, flicked effort from Paul Rutherford’s cross, but his effort is smartly caught by Ravens ‘keeper Chris Kettings. But it’s a brief reprieve for the Bromley stopper. Just five minutes later, Andy Wright nods home from Blakeman’s free-kick, and the home side have the lead. Can beleaguered Bromley – after four defeats on the spin – muster a response? Southport build from the back in a breathless first-half. After Frenchman Steve Pinau heads a promising opportunity over the bar just before the half-hour mark, it looks like this might not be Bromley’s day. But in the 36th minute, the capital club draw level. After good build-up play on the wing, the ball reaches Lee Minshull, whose hard, low shot squirms under the outstretched arm of Southport ‘keeper Max Crocombe. The young New Zealander looks on in despair as Minshull wheels away, and within ten minutes, that frustration is compounded. Whilst Paul Rutherford’s rasping effort beats a stranded Kettings – but flies wide – at one end, with the scores locked at 1-1, Bromley grasp their opportunity when it arrives, in the 45th minute. Joe Anderson’s whipped-in corner is defended haplessly, allowing Rob Swaine to nod home from close range. 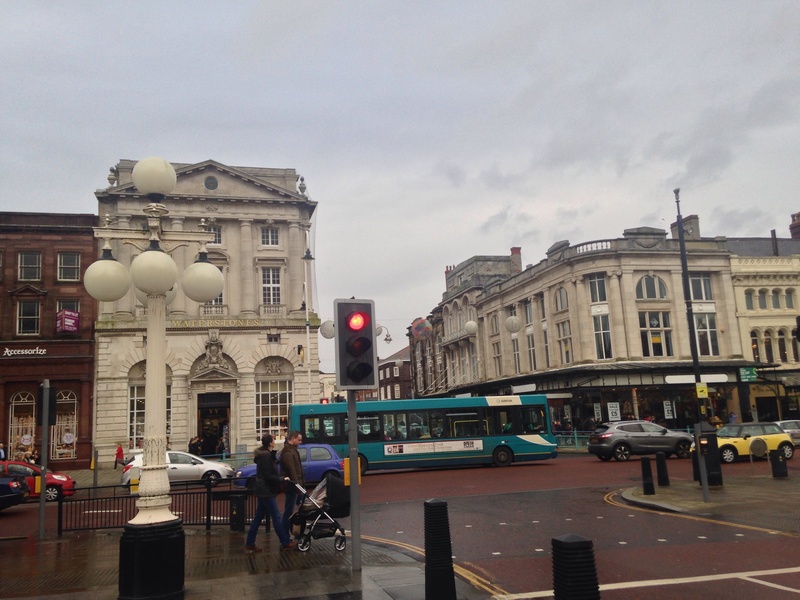 Southport’s pre-Maaria frailties seem to have returned to the surface, but only for an instant. The first-half drama is far from over. In the first minute of first-half stoppage time, just 79 seconds after Bromley take the lead, parity is restored in dramatic fashion. Southport’s number #11, Gary Jones picks the ball up in space and unleashes a long-range rocket, which rockets into the back of the Bromley net. It’s a fantastic crescendo to an exciting half, and those gathered file out of the Grandstand to grab a hot drink and catch our breath. As the second half begins, the intensity shows no sign of letting up. And neither, for that matter, do the goals. Perhaps the best of the lot comes in the 47th minute, as Southport’s speedy turnaround sees them lead for the second time in the game. A fantastic, slick, quick, passing move reaches the lively Paul Rutherford, whose cross is delivered at an awkward height for the Bromley back line, but lands perfectly for Mike Phenix. The Barnsley loanee finishes the move off with immense composure, as scenes of stunned delight play out on the bouncing rows of the Jack Carr terrace. 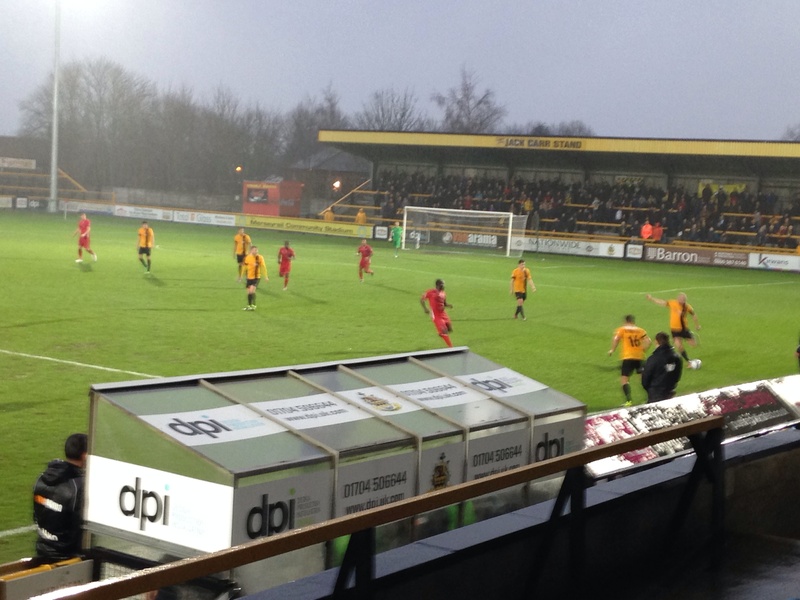 In the 59th minute, the home side double their lead, when a clumsy challenge rightly results in a Southport penalty. Ex-Hyde United man Louis Almond steps up to calmly convert the spot kick for his 7th of the season, and Bromley are increasingly being run ragged. And Jamie Allen joins in the fun on 75 minutes, finishing superbly into the Bromley net after a lovely run. Maaria’s troops have the Haig Avenue faithful in dreamland. Ex-Dover defender Sean Francis reduces the arrears to two a couple of minutes later, but Simon Bennett waves away a Bromley penalty claim – seemingly wrongly – and Max Crocombe makes a few smart saves, meaning that the closing stages never get too nervy for Southport. The home side get the points, the plaudits and probably immense confidence, after tearing their unwanted record as the league’s lowest scorers to ribbons. It’s been quite an afternoon. The exterior of the grandstand, advertising today’s clash. Travel: Southport is on the Chester-Southport train line, which calls at the main Manchester stations, as well as Bolton and Wigan Wallgate. There’s also the regular Hunts Cross-Southport service, which calls at the major Liverpool stations. By car, leave the M6 at Junction 26, and take the M58 towards Southport. Leave the M58 at Junction 3, and take the A570 around Ormskirk town centre, heading into Southport. The ground is located on Haig Avenue. Postcode: PR8 6JZ. 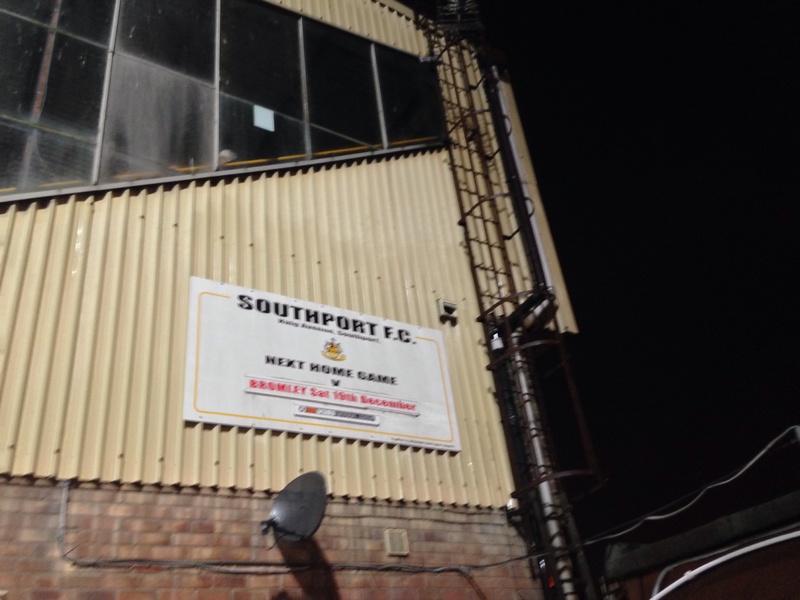 Posted on December 20, 2015, in Dave's Matchday Adventures, UTL Archive, Vanarama National League and tagged Bromley, Featured, Haig Avenue, Matchday, National League, Southport. Bookmark the permalink. Leave a comment.